Give your pop-up rooms some solid walls and floors! This kit, including 8 pieces of strong but lightweight double ply corrugated card board, comes printed with graphics to match your pop-up rooms. It is mailed flat but the interlocking pieces are easy and quick to assemble without any additional hardware or materials. After you glue your pop-up rooms to the walls your completed house will still fold flat for storage and travel. 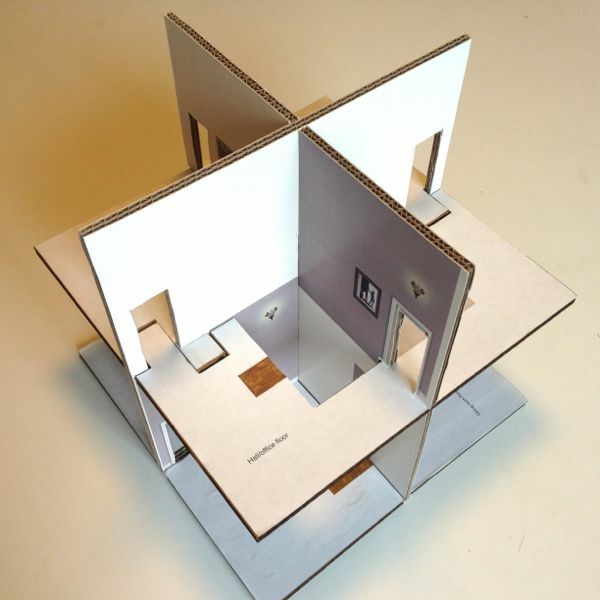 This house structure is included in the pop-up paper house kit, you only need to purchase it for use with the PDF download. Only 50 cardboard structures left! Once these are gone, the only way to get one will be to order the full kit. If you would like to pick up the structure from Brooklyn, NY, contact me and when you check out use the discount code NO-SHIPPING for a $12 discount which covers the flat USPS priority shipping fee. International fist class shipping will cost $25. Another option is to order the bamboo house structure for $62.00 from the “maker-on-demand” company, Ponoko, but this laser-cut version does not come with the house graphics pre-printed, so you will need to do some extra cutting and pasting (the image file is included with the Pop-up Paper House download). You cannot add the bamboo structure to your cart on this website, instead click on the link to buy it directly from Ponoko. It will take several weeks to be manufactured and shipped to you. This video shows a finished foam core prototype (with all the pop-up rooms attached) being assembled and pulled apart.